You don’t have to learn Computer, just learn GROSS. Optimized for faster Checkouts & Cash Control, keeping Records accurate. Don’t remember product discounts and schemes! No problem GROSS can handle all with a little Preset by the Administrator. Scan the BARCODE -> Press F12, you have a Bill Ready. Receiving payments as you wish to by our Multi-mode Transaction or Normal-mode (Cash / Card / Cheque even on Credit). Giving your clients the option to apply Discount Card or Vouchers. GROSS INN has been helping owner managing their restaurant related inventories and in maximizing their profit. 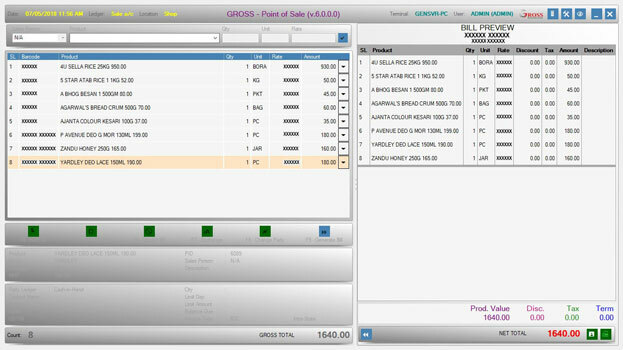 All entries get integrated with GROSS and effects to inventory as well as accounts. 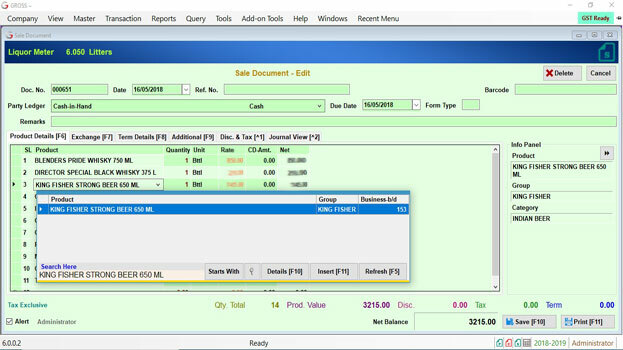 In just one Single Window - Items can be selected by Name /Short Name /Code /Barcode can be filtered by its Group /Category /Size etc. Calculate Tax on Exclusive /Inclusive mode. Preparation of Recipe for Finished Products. Auto Consumption of Raw materials through sales according to recipe. GROSS Life Line is the solution for all Retailers, Medicine Shops, Chemists etc. who wants to handle all accounting tasks by their own efficiently. 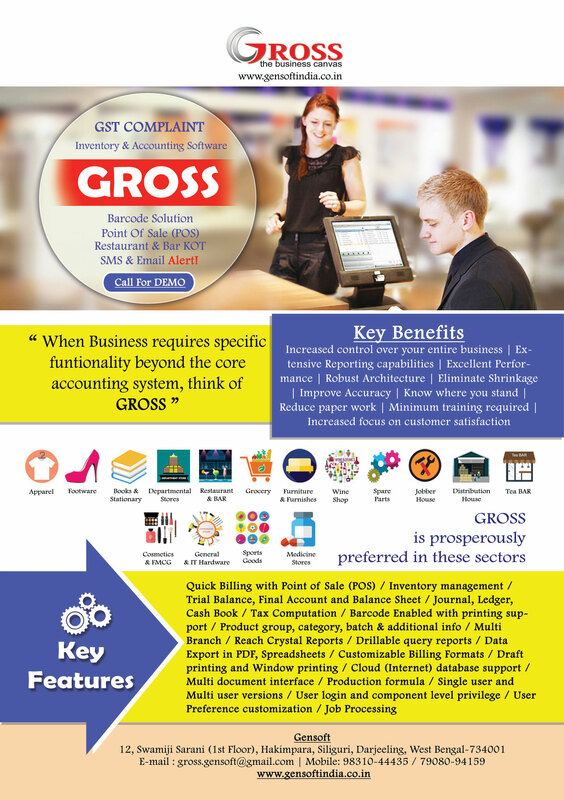 GROSS Life Line is Medical Store Management System takes care of all sophisticated requirement and focuses on the customer needs at the Medical Shops. Main features include Invoicing, Inventory and Stock Control, Accounting, Client and Vendor Management. Contains Modules like Drug Information System, Dispensing and Stock Management. Helps to track Profit & Loss, Profitable Clients & Products. Flexible and adaptive software very beneficial for Distributors, Chemists, Chain Pharmacies, Department Stores, and General Stores of any size. It makes sure that money is not blocked in non-moving stock and traces expiry items in stock. 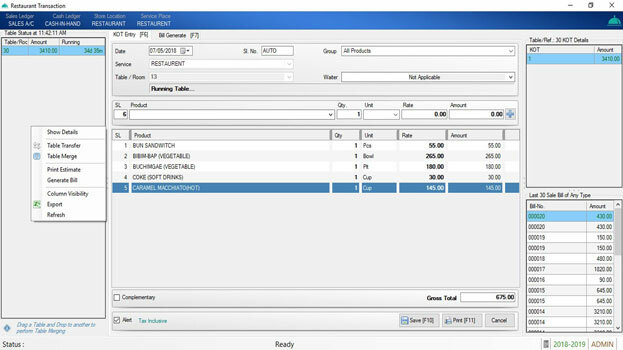 It is a Point-of-Sale & Inventory Control Software designed specifically for Retail Liquor Stores. Enhanced with an easy to use Point-of-Sale interface that speeds customers through and provides all necessary sales functions. Covers all the basic general functions needed and is packed with Extra features just for Liquor Retailers. 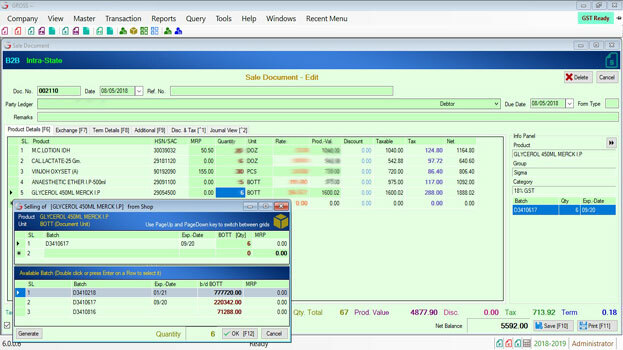 Columnar Reports for Sales, Purchases & Stock Vendor. Category, Product & Capacity wise Columnar. Bottle details in Stock Report based on Purchase Report, Category & Capacity(ltr.). Quick billing by scanning GST Barcodes from bottle through scanner. Can set Maximum volume in Ltrs per Sale Bill (shows in ‘Liter Meter’). Can restrict No. of Lines (Products) in Sales Bill. Simple auto generation of Product names through parameter selection. Party /Party Group wise Product Sale /Purchase Rate Chart. Collection Summary Date/ Product/ Salesman/ Userwise.